Will be held April 6 & 7, 2019 in West Palm Beach. Single Agency and/or Small Market teams only. All first responders welcome. Myrtle Beach Spring National Championship. Entry fee is $450 per team. 5 GG. Pool play for seating. Provided bats/ 2 state rule/ Balls will be sold at the complex. All teams must provide a roster and credentials will be checked. Teams planning on flying in for the tournament should look at flights on Spirit into Myrtle Beach International Airport. We will have plenty of rooms blocked off at the host hotels as soon as possible. There will be a players party as well as a home run derby!!!! We are looking at the possibility of a golf outing on Friday if we get enough interest. 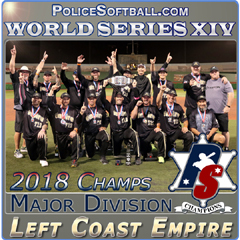 E mailed to (jim2xs@hotmail.com) Your roster should be the same format as the World Series. We moved a week back this year to separate from the celebrity golf tournament. Hopefully this will make lodging easier and prices cheaper. Don’t miss this opportunity to vacation with your family and play in one of the most beautiful places on earth. 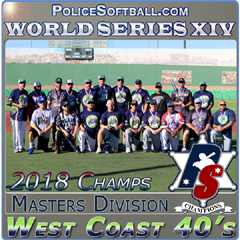 Winner and Runners Up will receive a Paid Entry into the 2019 PS.com World Series, In addition the winners of each Ps.com divisions will receive 1000 travel money towards Vegas trip. 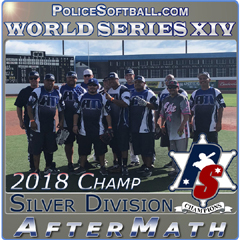 Tournament Format- 3 Game bracket followed by seeding into either PS.com Major/Gold or Guns &Hoses divisions which will be a double elimination tournament. Games will be played late into the evening on both nights. All PS.com division teams need to meet PS.com minimum requirements but there is NO State rule. Hotel Accommodations- Long Island Marriot located at 101 James Doolittle Blvd. Uniondale NY 11553 (Hotel Rate is $152 a night) Call 1(800) 228-9290 or 516-794-3800 to reserve before July 4th that is the “Cutoff Date” for rooms. 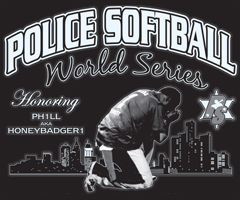 Please use “Police Softball Tournament” to book. It has been pool play, into a double elim bracket, with the first teams eliminated being placed in a drop down lower bracket, for the last few years. With prizes for both brackets. That is the plan again, but depending on the number of teams, that could change. There will be a $325 entry fee this year. Modified USSSA rules, with USSSA umpires. This will hopefuly again be provided bat tournament. Balls must be purchased from the tournament director for use throughout the tournament. 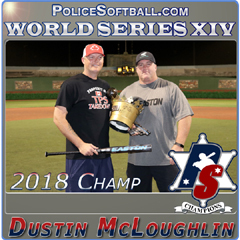 Similar to previous years, there will be cash prizes for top finishers in the main bracket, as well as prizes for top finishers in drop down bracket (Southwest Airlines has sponsored the previous 3 years and provided prizes for the drop down bracket). Also, custom all tournament awards will be given out (I've gotten great feedback from those who have received one of these the last two years, and we will be doing it again). 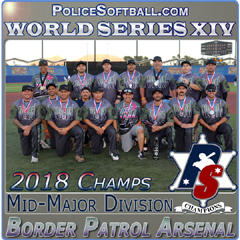 All players must meet Police Softball Minimum Eligibility Standards and bring credentials. I will determine the state rule for this tournament, by the end of the year. Please check the link below and make sure your team is eligible, that responsibility falls on the team managers. Call me or email me with any questions. There will be a pre-tournament party for all the teams to get together on Friday evening, with drinks and food provided. Drinks BEER/WATER/SODA/BODY ARMOR will be provided for everyone, at the complex, until they run out. If anyone wants to come in a day early, the Cardinals will be playing the Cubs at 6:15pm on Thursday August 1st. I will arrange for tickets to this game, like previous years, I will just need a total number of those who would use the tickets, from teams interested. Modified USSSA rules (same we use every year). 5 game guarantee. Majors/Gold divisions for double elimination playoffs. 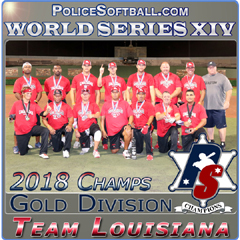 All teams that attended the 2018 World Series have a spot reserved until May 1, 2019. If not paid by May 1, your spot becomes an "at large" berth filled on a first come/first served basis.